Hello everyone ! hope that you are all well and enjoying the long awaited sunshine we are having , as for me i think its about time and enjoying every second of it ! Here is todays make that i call from the stash ! Heres how i made it . next i added pale blue and white gingham ribbon from Joanna Sheen using double sided tape . 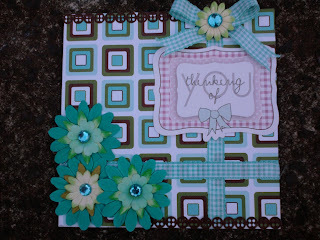 I then added the "Thinking of You " sentiment and bow in the same gingham ribbon . Next i built up the flowers and attatched them to the bottom left corner and added some button ribbon to the top and bottom . To finish i added some stick on gems to the centre of the flowers for just a little bling . I am following you now (although I thought I already was - gets confusing with Google and Networked blogs etc). Tina this is gorgeous! I love the paper and the flowers are fabulous. I like this the colours are lovely. my first steampunk card !